Saturn is now in the southwestern sky at dusk. It outshines the stars around it, so it’s also easy to see. Mars is a little higher in the morning sky this month. Look for it low in the east at dawn. Mars remains dimmer then average, though, and won’t rival the brighter stars until next spring. Venus and Jupiter reappear in the morning sky this month. Venus is already visible in the east at dawn; Jupiter will join it after the middle of the month. Venus outshines everything but the Sun and the Moon, while Jupiter is next brightest after Venus. Both, then, easily outshine all the stars we see at night and are clearly visible even in twilight. Venus, Mars, and Jupiter will come close together in the sky late next month. The Big Dipper is left of the North Star, with its handle pointing up. From that handle, you can ‘arc to Arcturus’ in the west at dusk. 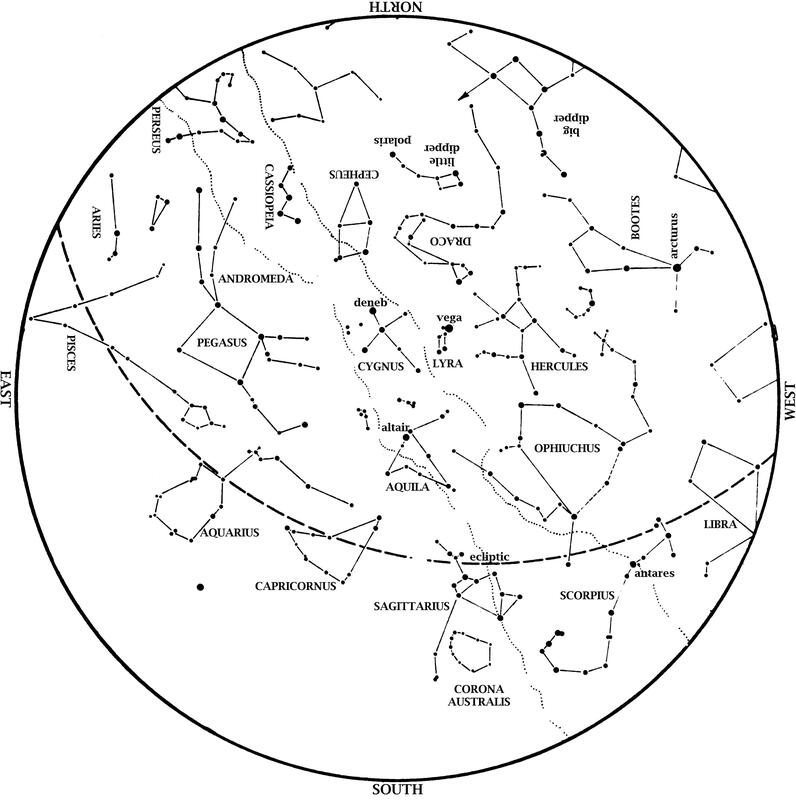 Antares, brightest star of Scorpius, the Scorpion, is in the southwest, with the ‘teapot’ of Sagittarius to its left. Saturn is to the right of the scorpion’s head. The Summer Triangle is overhead. The Great Square of Pegasus is now in the east, indicating the approaching fall. Last Quarter: Sept. 5, 4:54 a.m.
New: Sept. 13, 1:41 a.m.
First Quarter: Sept. 21, 3:59 p.m.
Full: Sept. 27, 9:50 p.m. The Full Moon of September 27 enters the Earth shadow, causing a total lunar eclipse. Partial eclipse begins at 8:07 pm CDT, about an hour after sunset and right as twilight fades. The Moon is totally eclipsed by 9:10. Totality lasts 74 minutes, until 10:24. The Moon then comes out of eclipse until the eclipse is over at 11:27. This is the last of a series of four total lunar eclipses in 2014-2015, all visible from Houston. Unlike the previous three, which occurred at midnight or at dawn, this eclipse takes place in evening hours while everyone is still awake. Remember, whoever can see the Moon can watch the eclipse. Let’s hope the weather cooperates and we can all enjoy it. Our George Observatory will be open Sunday evening, September 27, for this event. If we miss this eclipse, the next one we can see is at dawn Jan. 31, 2018. At 3:21 a.m. on Wednesday, Sept. 23, the Sun is directly overhead at the equator, shifting southwards. This, then, marks the autumnal equinox, the ‘official’ start of fall. On this date (and on the spring equinox in March) everyone on Earth has the same amount of daylight. After this date, night is longer than day for us and keeps getting longer until our longest night at the winter solstice. Below the equator, day becomes longer than night after this equinox. It is springtime down there. also about the moon – is the moon’s orbit’s radius slowly increasing and the length of the day slowly decreasing from friction of the ocean with sea floor due to the tides? Changes in moon and earth’s motion due to conservation of momentum? How long was a t-rex day? The same process which de-spun the Moon until the near side became locked to Earth also de-spins the Earth, due to Newton’s third law (action-reaction). Because the Moon rotates in Earth’s gravitational field, Earth’s gravity pull raised a tidal bulge on the Moon. The attraction between the earth and this bulge resisted and slowed down the Moon’s rotation until that rotation was 27.3 days long, equal to the Moon’s orbital period. The Moon is doing the exact same thing to the Earth! However, because Earth is more massive than the Moon, it’s taking much longer to slow down the Earth’s rotation and lock it to the Moon. Using atomic clocks, scientists have the determined that the day gets longer by 2 milliseconds per century due to this effect, or 20 seconds per million years. That means the 65 million years ago, when the last dinosaurs died, the Earth day was just 21.667 minutes shorter than it is today. Even in 5 billion years, when the Sun expands as a red giant and swallows the Earth, the day will be just over twice as long as it is now. Due to conservation of energy, the energy Earth loses as it de-spins must go somewhere. Indeed, the Moon gains this energy, which slightly raises its orbit by about 4 cm per year.